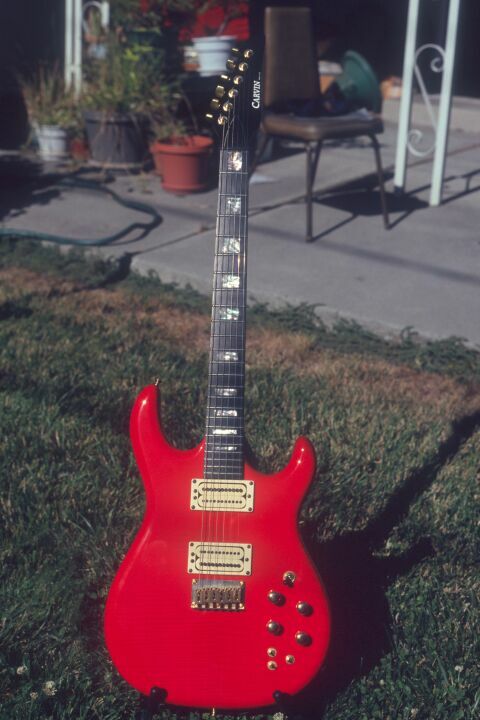 This guitar, another red-tag special, followed me home from my very first visit to Carvin's San Diego, CA factory store in July 2000. At $799 plus case it wasn't quite the steal the basses were, but it was certainly a sweet deal nonetheless! This little beauty has several standard features common to the DC400 line: flamed maple top, active/passive electronics, Sperzel locking tuners, and abalone block position markers. 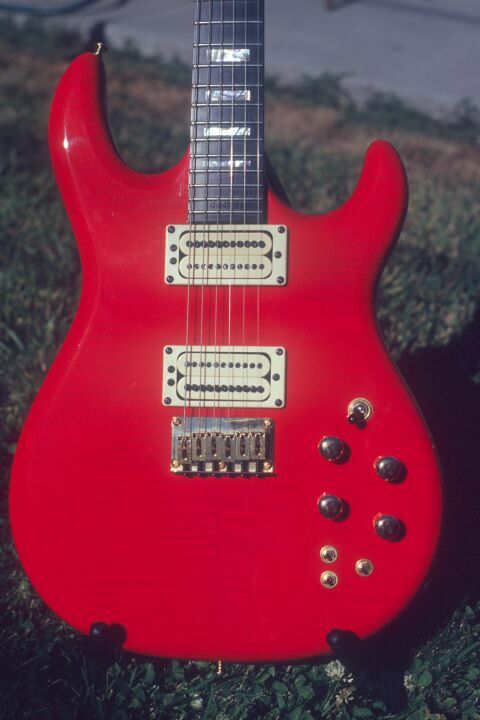 The crimson red finish tends to obscure the flame in the top, but it's there, trust me! The standard bridge allows through-body stringing, which I believe improves sustain. 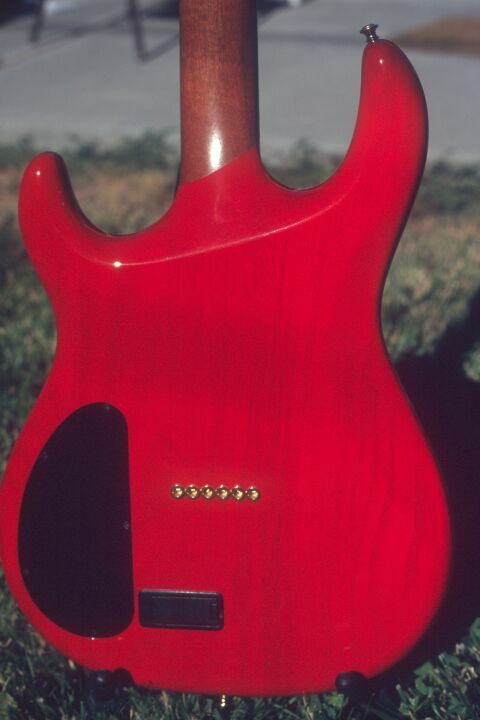 What's not visible from the front is the all-mahogany construction underneath the flamed top. Mahogany body wings and a one-piece mahogany neck combine with the maple top, giving the standard C22 humbuckers a mellow but clear and distinct sound. The 24-fret ebony fingerboard is equipped with medium jumbo frets and abalone block position inlays. I really like the big frets, although I can strangle the guitar and play out of tune by pressing too hard. The extra meat in the frets guarantees that I'll get many years of playing out of this axe before it needs a refret. Initially I found the color combination a bit gaudy. But it has grown on me. 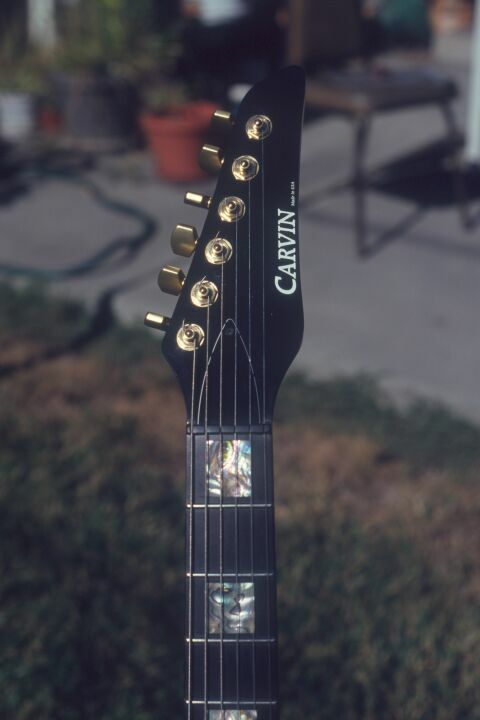 The black painted headstock used to be the factory default; I believe Carvin is now painting the headstock the same color as the body unless you specifically ask for something different. The pickups are Carvin C22N neck and C22T bridge. These are standard on most of Carvin's guitars with humbuckers. They're fairly bright for humbuckers, and have a moderate output level. Each has 11 adjustable pole pieces, and the 3-screw mounts allow adjustment for height and tilt. Carvin's standard 9V active/passive electronics provide a number of tonal options. There are switches for pickup select (neck/both/bridge), coil split for each pickup, and phase reversal for the bridge pickup. All switches are always in effect, whether in active or passive mode. The active/passive module has four controls. In active mode, there is a master volume, and cut/boost bass and treble controls. The fourth knob is unused in active mode. A single MC33178 chip drives the active module, offering hundreds of hours of playing on a single 9V battery. Passive mode can be reached by pulling up on the master volume knob. Then the fourth knob, a passive treble-cut knob similar to that on most passive guitars, comes into play. Personally, I find I don't use the active controls very much. The preamp seems to make the pickups sound sterile, and the active treble control in particular does not produce the kinds of sounds I like. The bass control, on the other hand, is very useful, but mostly for rolling off excess bass. For the kinds of sounds I want to make, the passive mode works best. I can roll off the passive tone control a bit, crank up my X-60A amp, and I'm instantly in classic rock heaven. Where the DC400 shines is in playability. The tung oiled neck is extremely fast, with a relatively thin profile. I'd actually prefer a slightly fatter neck profile, but I've grown accustomed to this one. The action can be adjusted extremely low. 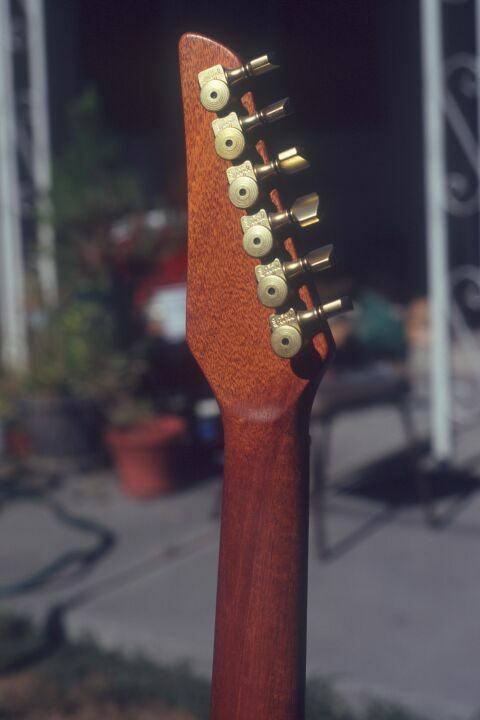 The one-piece mahogany through-neck seems plenty stable. I like a little higher action than Carvin's factory setup, but even off the rack, any fret buzz you get is your own fault! Balance is near-perfect for me. This is a light guitar, but don't equate light with flimsy - this baby has sustain for days! Combined with the rounded body edges, I could play this DC400 all day long... and some days, I do. As I mentioned above, the active mode sounds are a little sterile to my ears. My DC400 spends most of its time in passive mode. The C22 pickups really come to life in passive mode, with a sweet, full, resonant tone. The bridge pickup can be a bit too bright, but rolling back the passive tone knob quickly brings that under control. I haven't really found a tone I like with the coil-split or reverse phase switches. With both pickups selected and split, it will do a pale imitation of a Telecaster. But that's not this guitar's real strength. Leave the pickups in humbucking mode and rock away to your heart's content! Here are some more pictures showing some of the details of this beautiful instrument. The rather plain black headstock is set off by the gold Sperzel tuners. Check the colors in the abalone inlays! The flame in the top is more clearly visible in this picture. 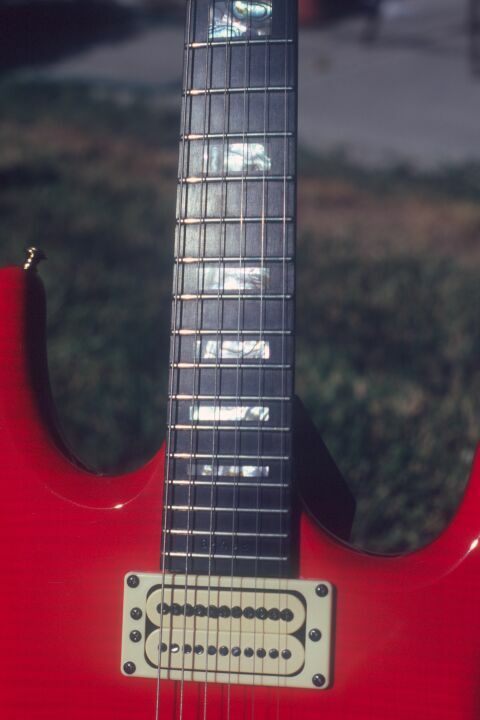 Strangely, the grain in the mahogany body shows through the crimson finish very clearly! Also note the smooth neck heel and the transition to the tung oil finish on the neck. Yep, it's a one-piece neck. And those are definitely Sperzels. "Telecaster" is a registered trademark of Fender Musical Instrument Corp., and is used here for illustrative purposes only. DC400 / http://www.chucko.com/Carvin/DC400.html / Copyright © 2002 Chuck Fry / All rights reserved.